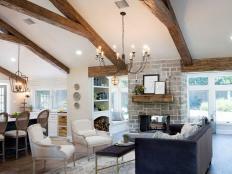 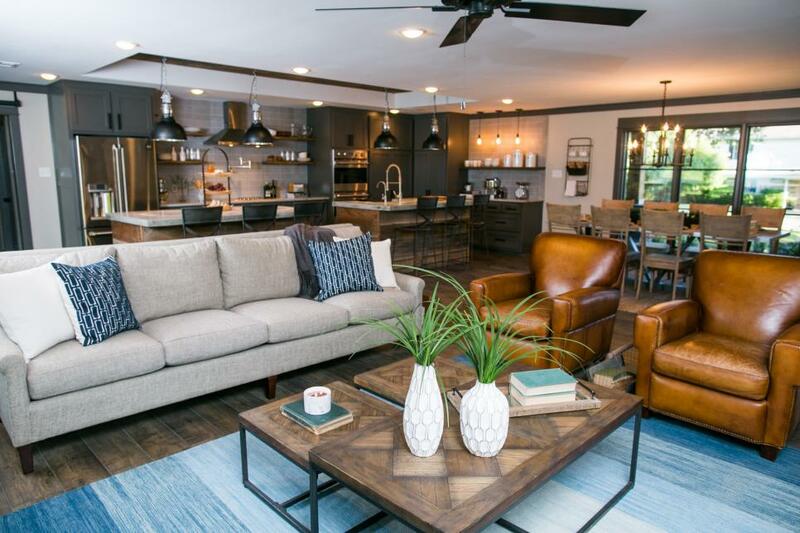 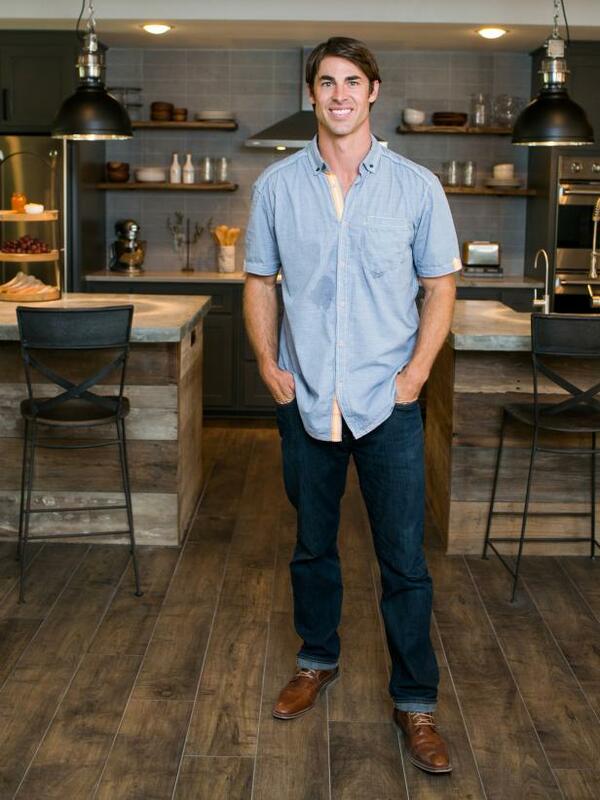 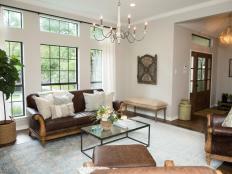 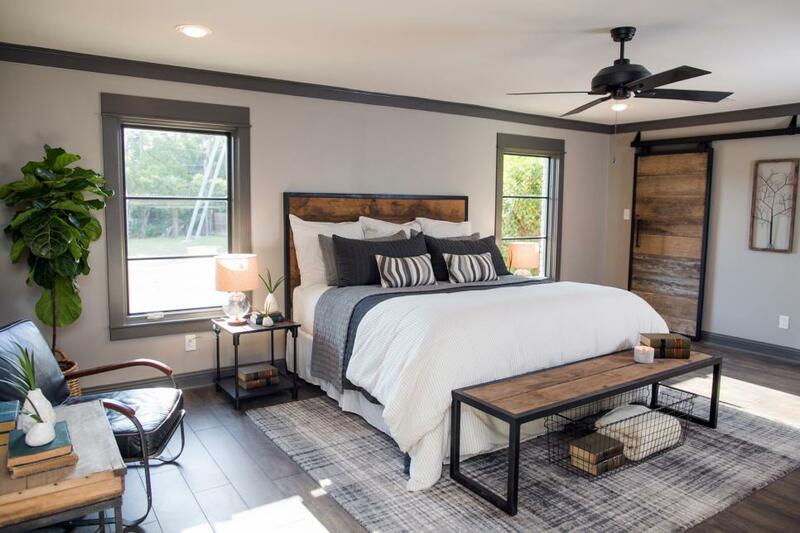 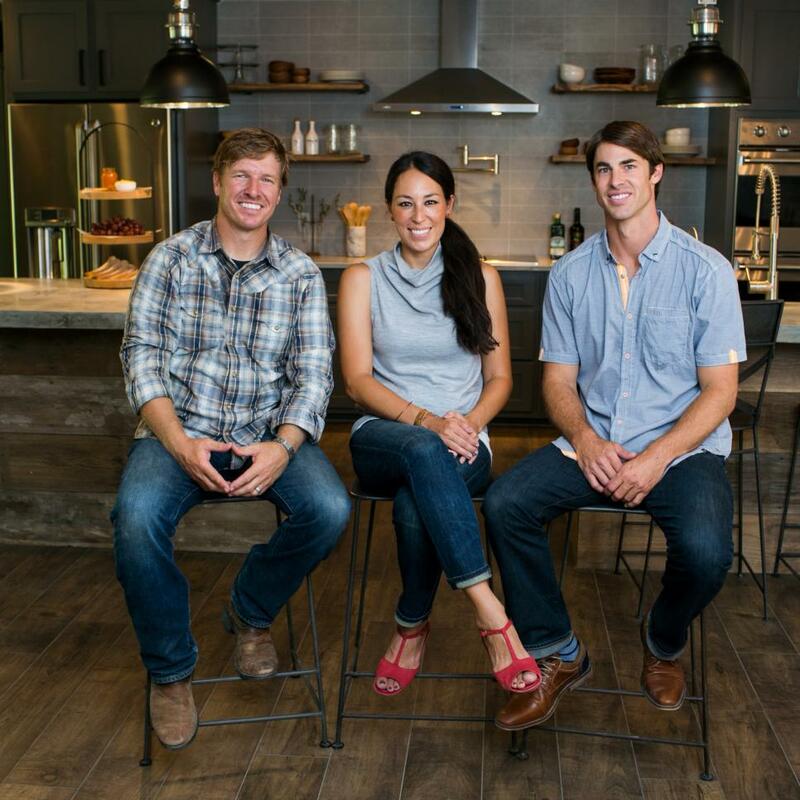 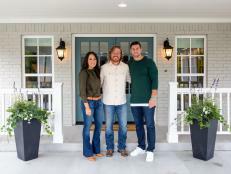 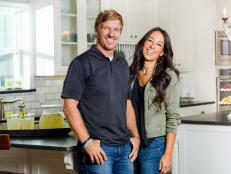 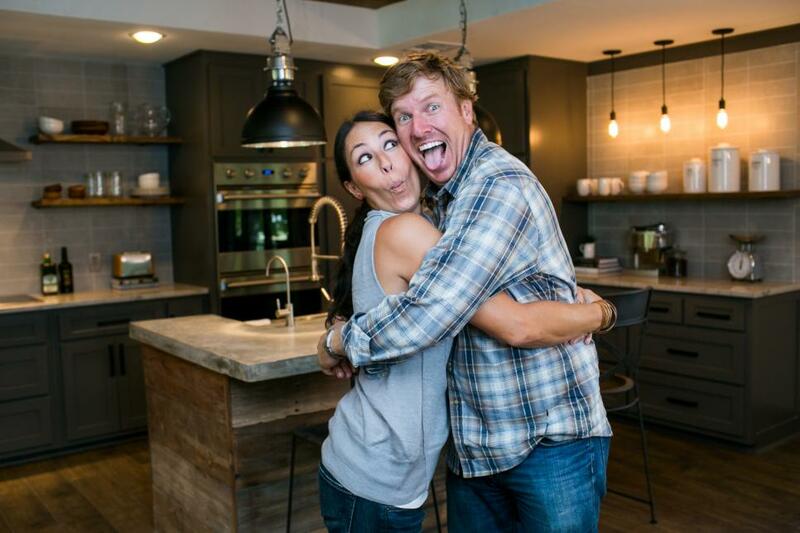 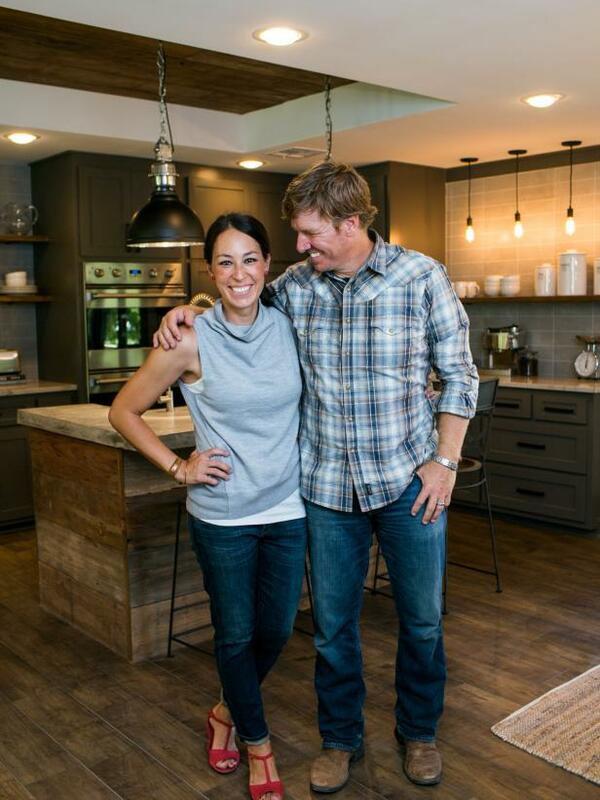 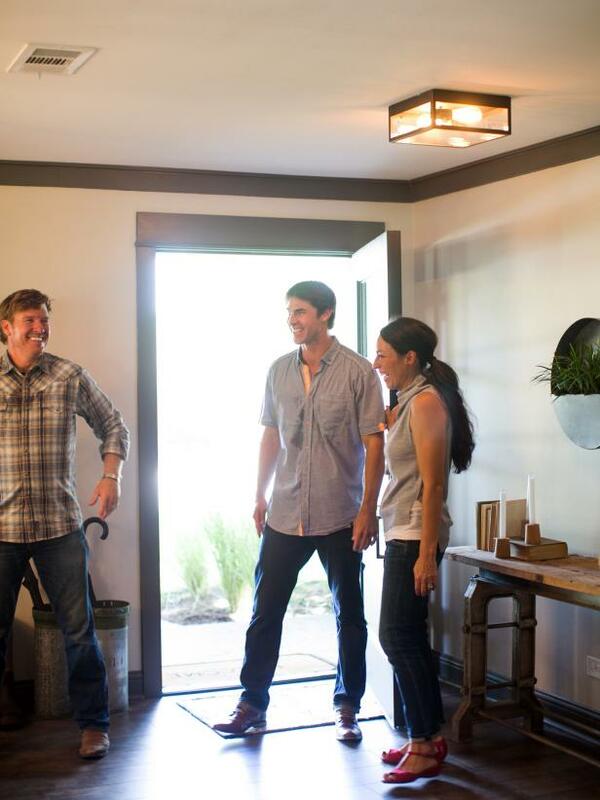 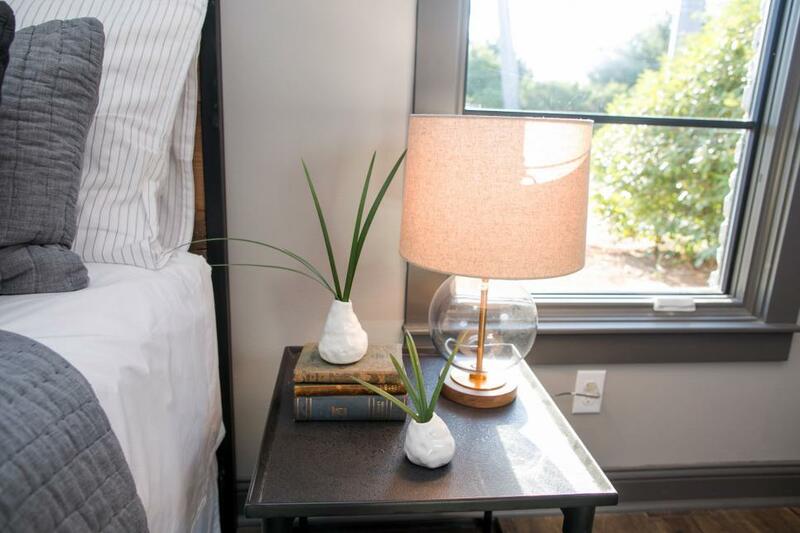 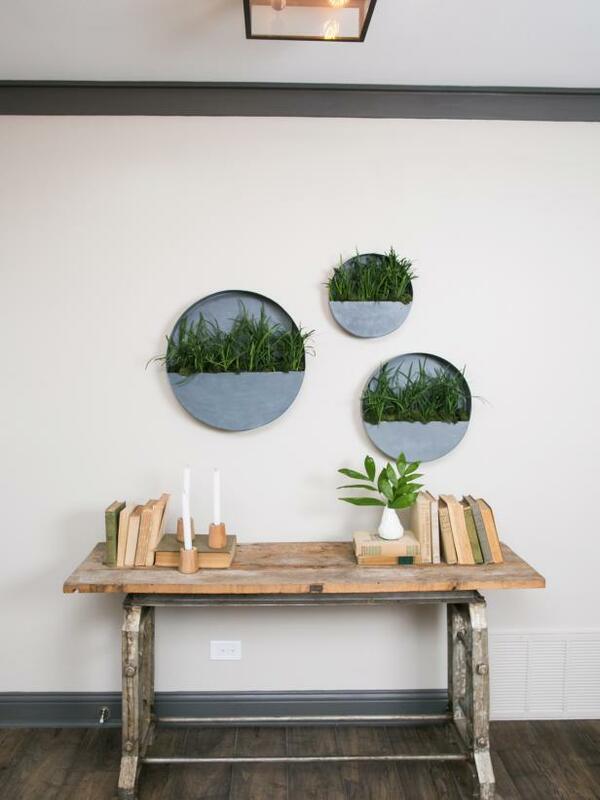 Chip and Joanna Gaines help a Waco native, moving back home from New York, find and fix up a lakefront home to create a stylish bachelor pad that has a masculine feel and a touch of class. 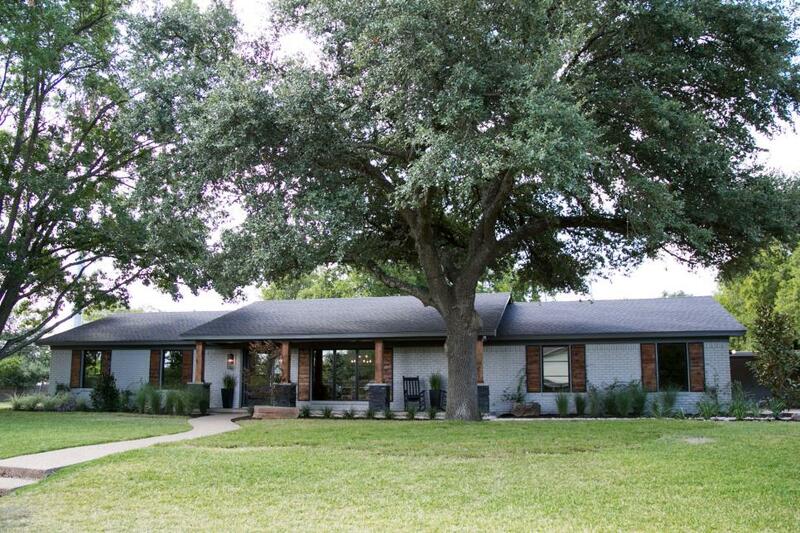 Chip and Joanna transformed a 1969 ranch house with a bland, nondescript exterior into this stylized home with standout curb appeal. 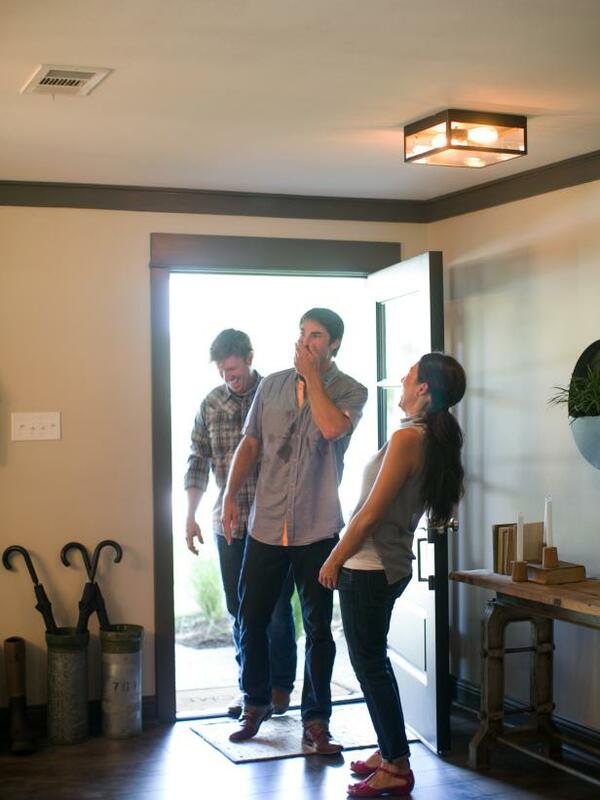 Chip and his crew removed two walls to substantially expand the footprint of a tiny kitchen and open up sight lines to the living room and formerly closed off den. 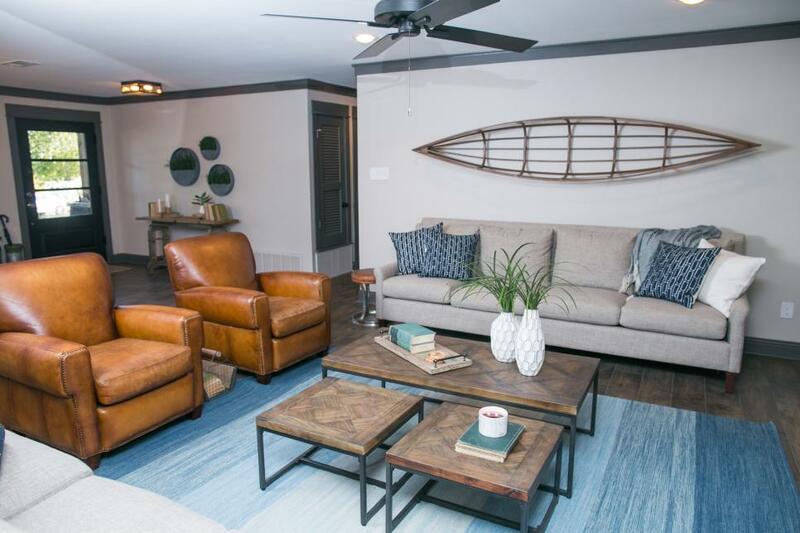 For this lakefront property, Chip and Joanna created a blend of modern and ranch style elements to create the perfect space for a homeowner with a love of entertaining and the outdoors. 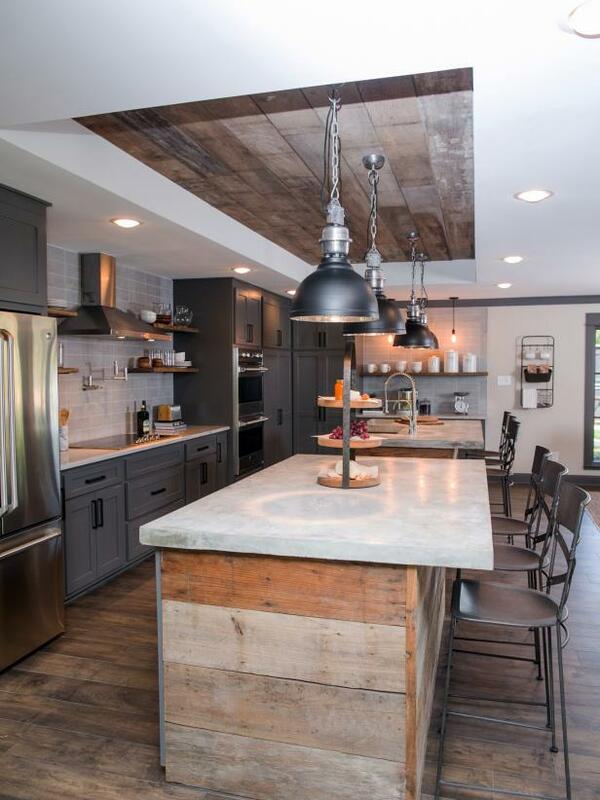 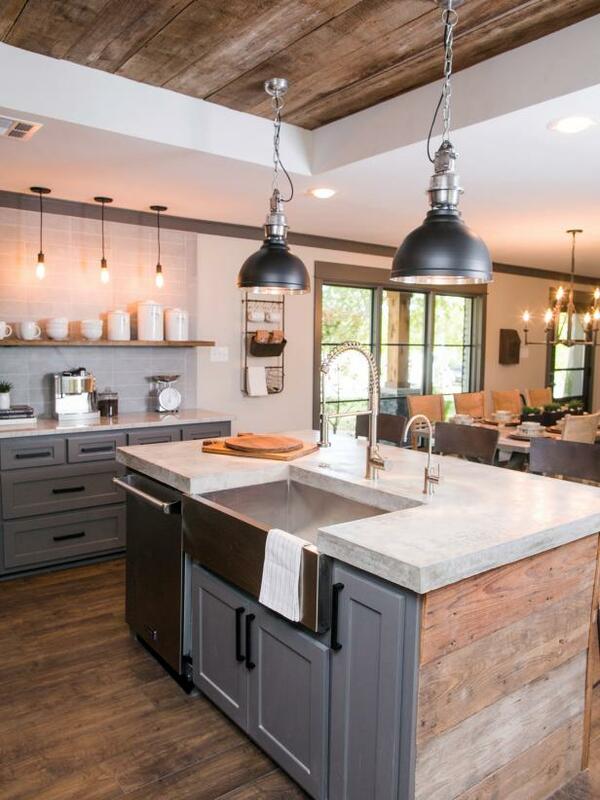 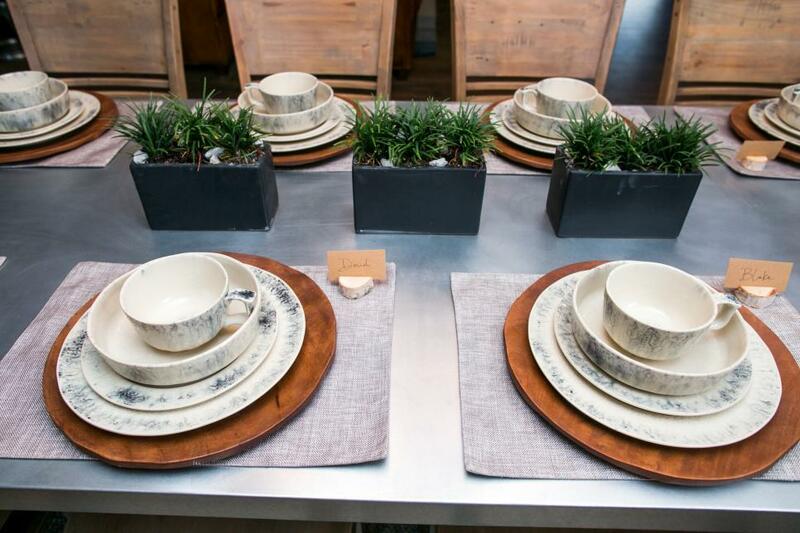 The expanded kitchen features twin islands with concrete countertops and bases wrapped in reclaimed wood. 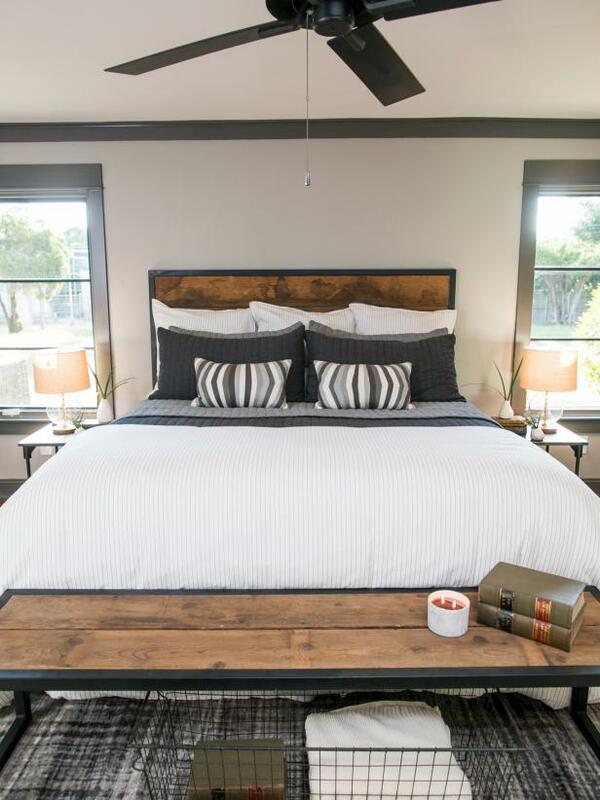 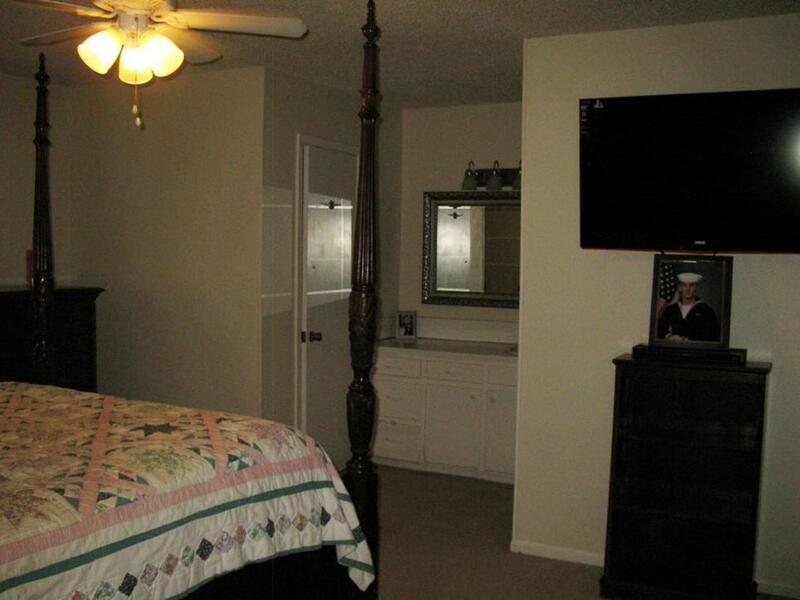 Yet another wall was removed in order to merge two bedrooms and create an enlarged master suite. 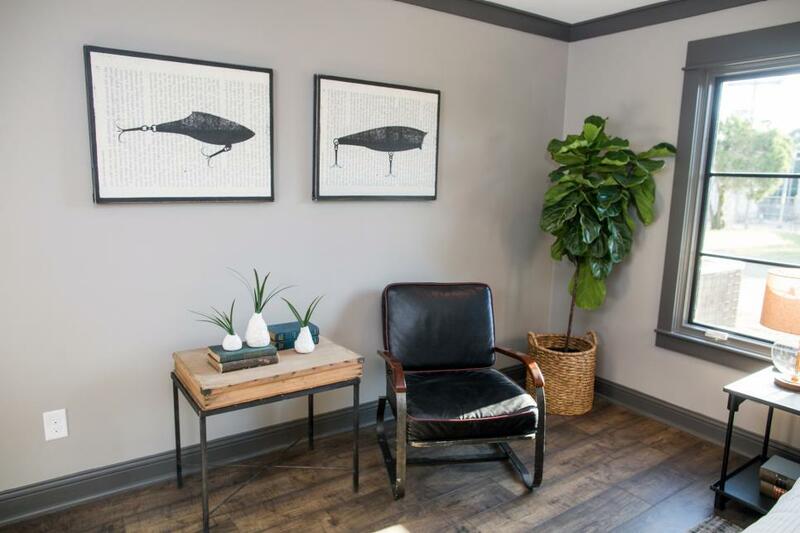 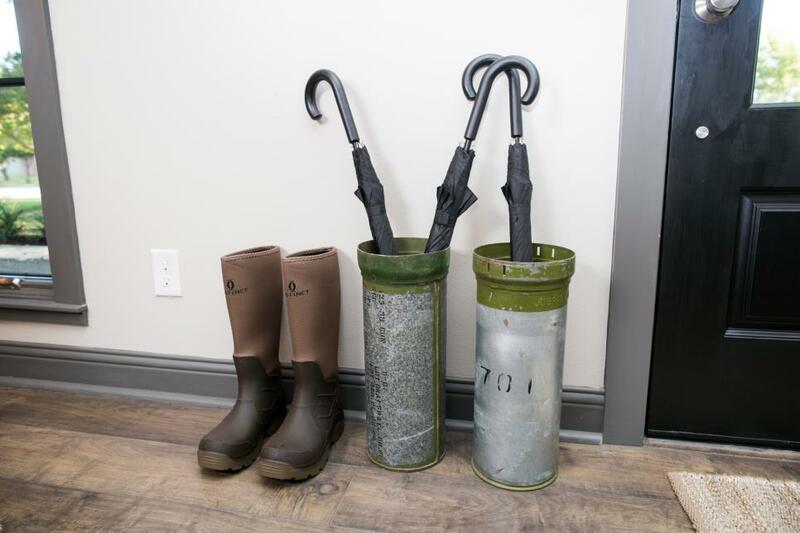 Joanna maintained the earthy and masculine aesthetic with dark wood floors, contrasting tones, gray walls, plenty of wood and a pair of framed prints based on vintage fishing-lure designs. 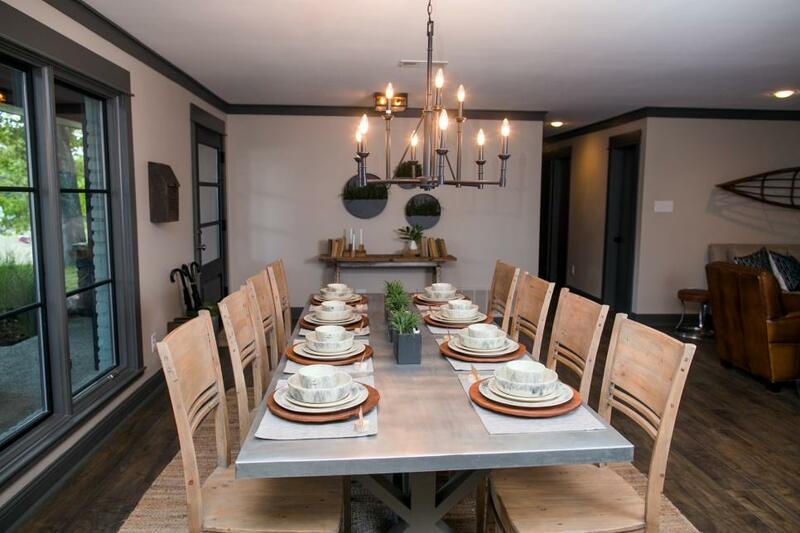 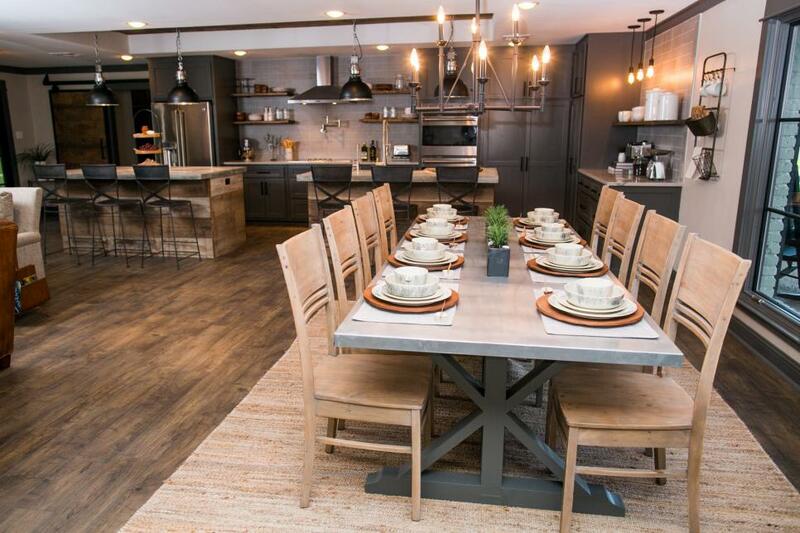 For the dining room, Joanna commissioned a custom table with galvanized metal surface and paired it with rustic wood chairs. 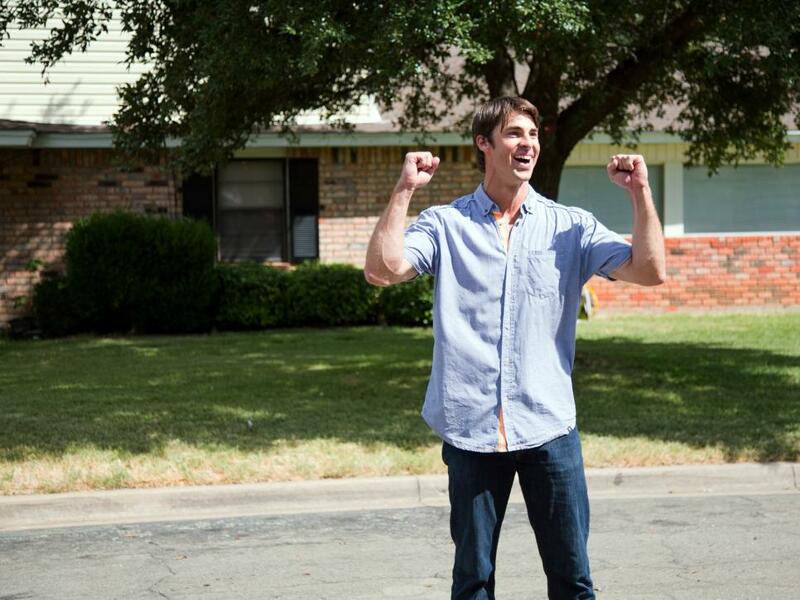 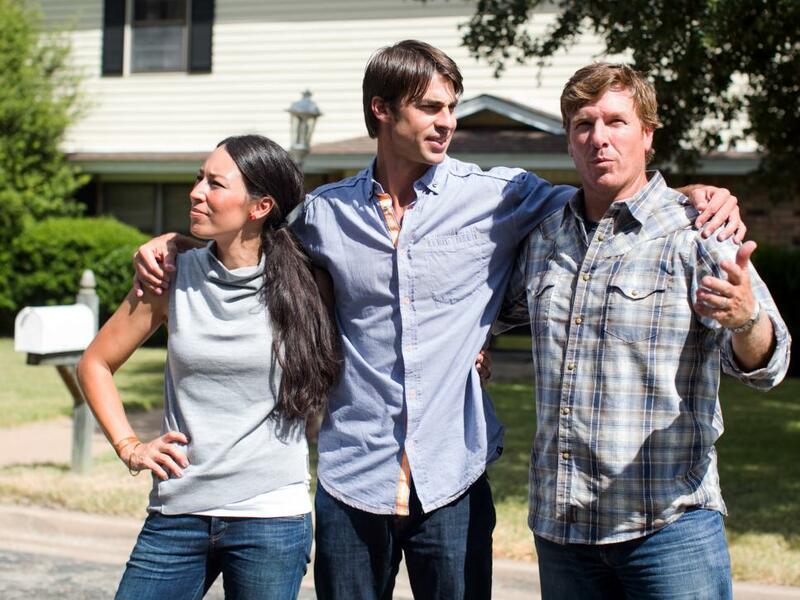 After living for several years in New York City, 37-year-old bachelor David Ridley – whom Chip quickly dubbed Waco's most eligible bachelor – was eager to return to his roots in Waco. 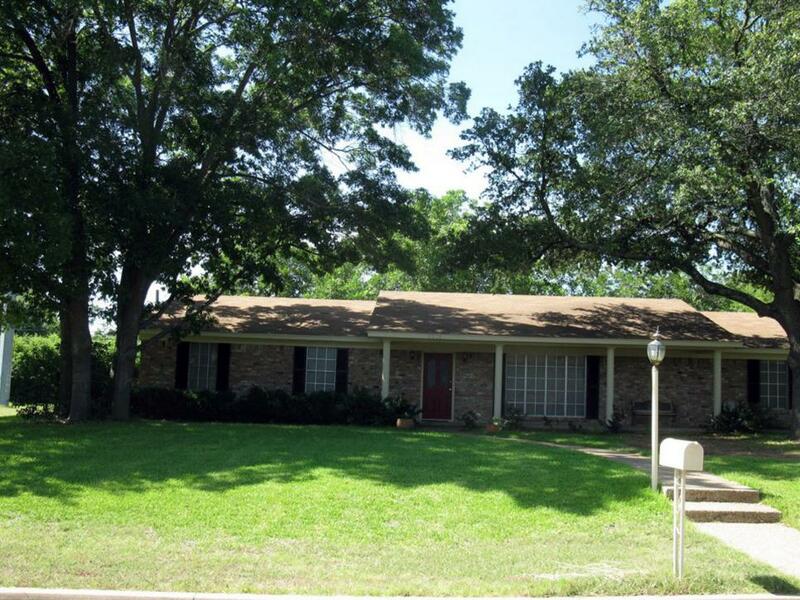 David was looking for house in the Mountainview area, close to Lake Waco. 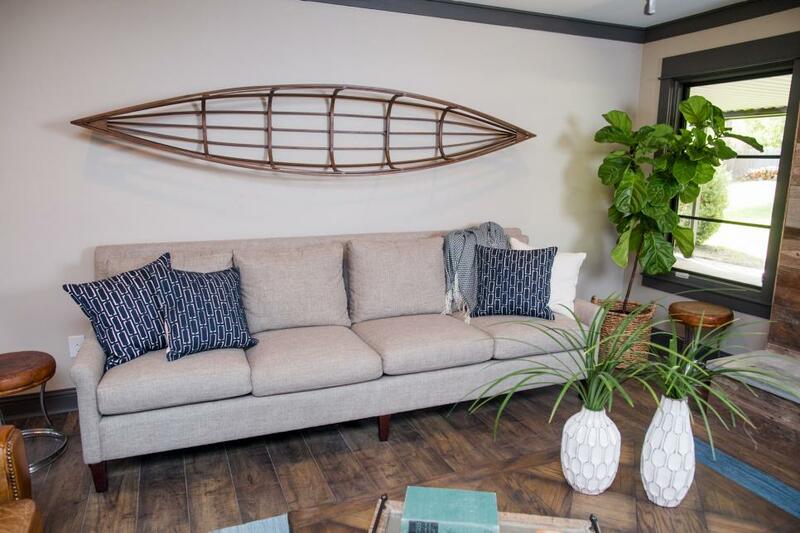 He enjoys fishing, water sports and the outdoors. 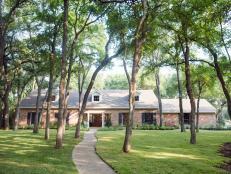 He wanted a house with plenty of room for entertaining and favors more modern architecture and decor. 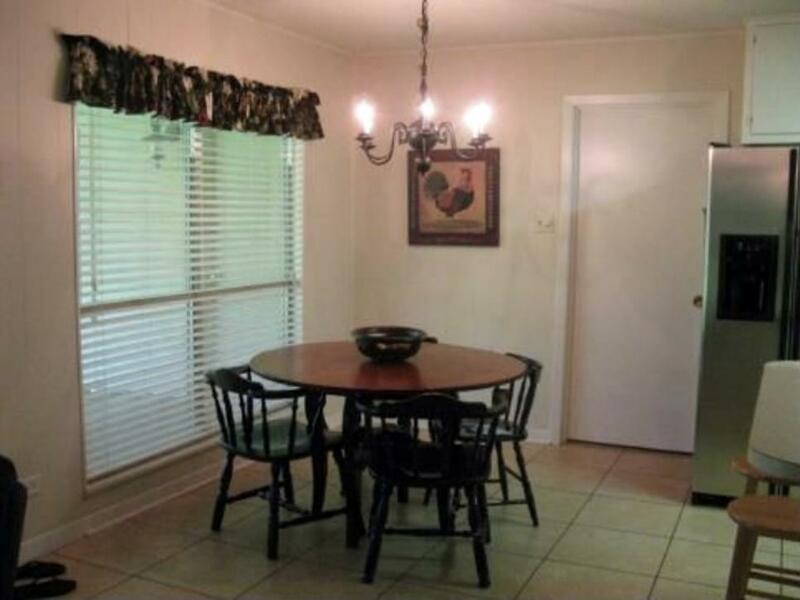 His all-in budget was $272,000. 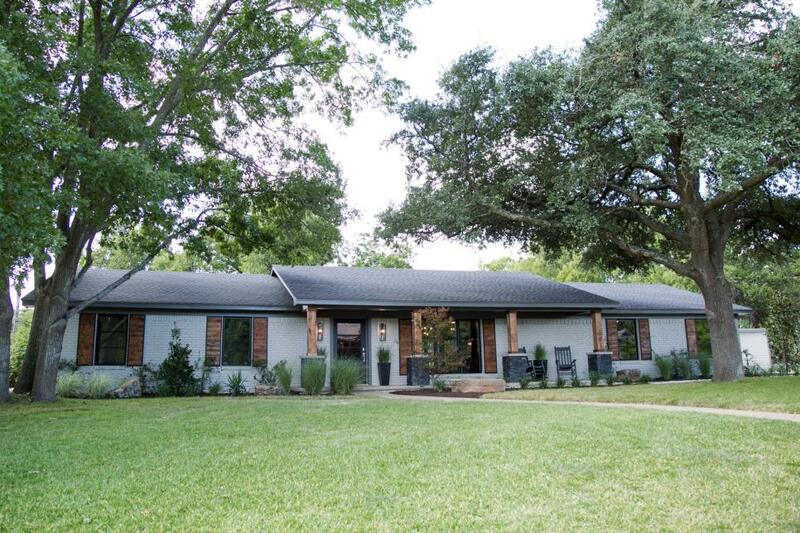 This third home on Chip and Joanna's tour was built in 1968 and boasted a desirable location, some beautiful trees and a big backyard, but the exterior lacked distinguising features and visual focus. 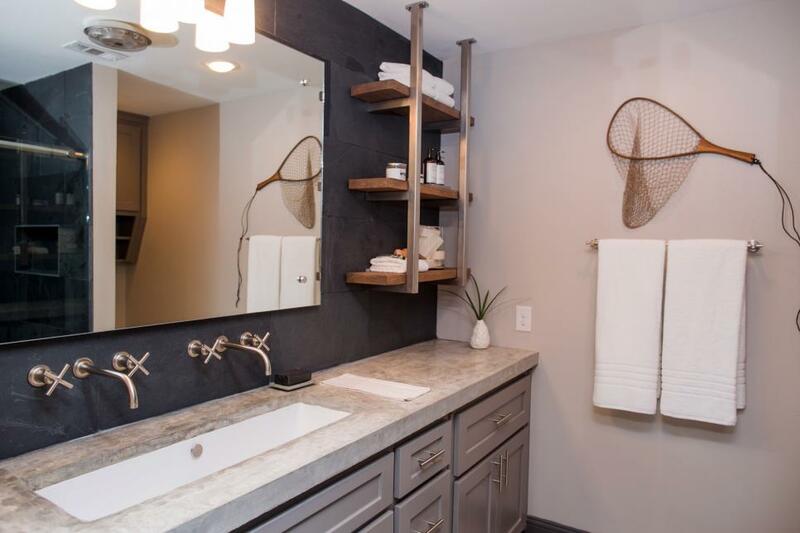 It did, however, come with five bedrooms, two baths and a list price of $169,000 leaving the homeowner with a renovation budget of just over $100,000. 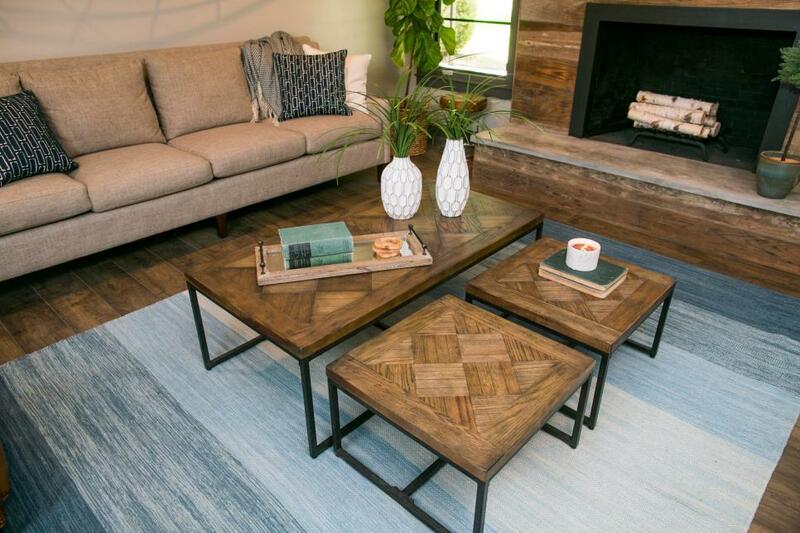 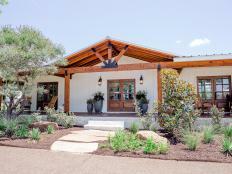 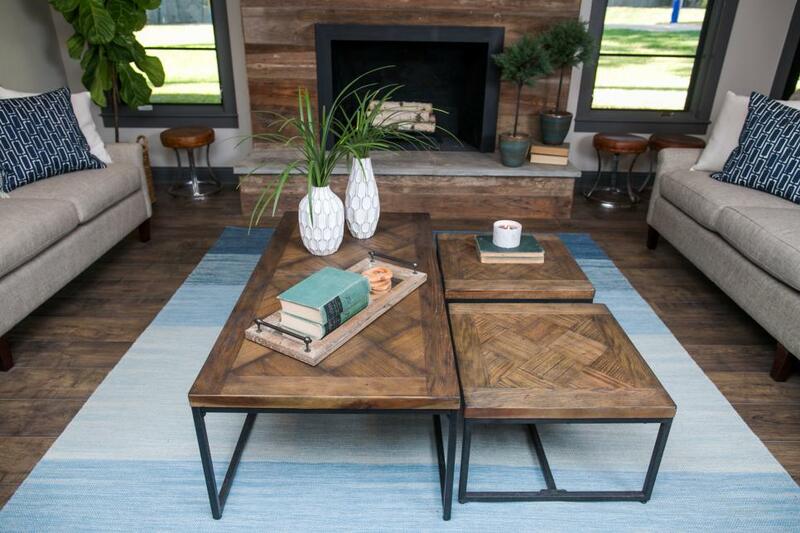 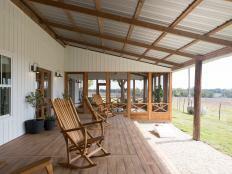 Both inside and out, Joanna's design brings to the home a more updated take on the traditional ranch concept. 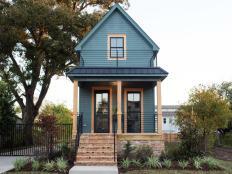 The exterior is painted in light gray offset by a darker roof and new wood shutters. 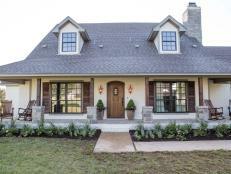 The front columns are given a more substantial look, wrapped in natural cedar and bolstered with rock skirt bases and concrete ledges. 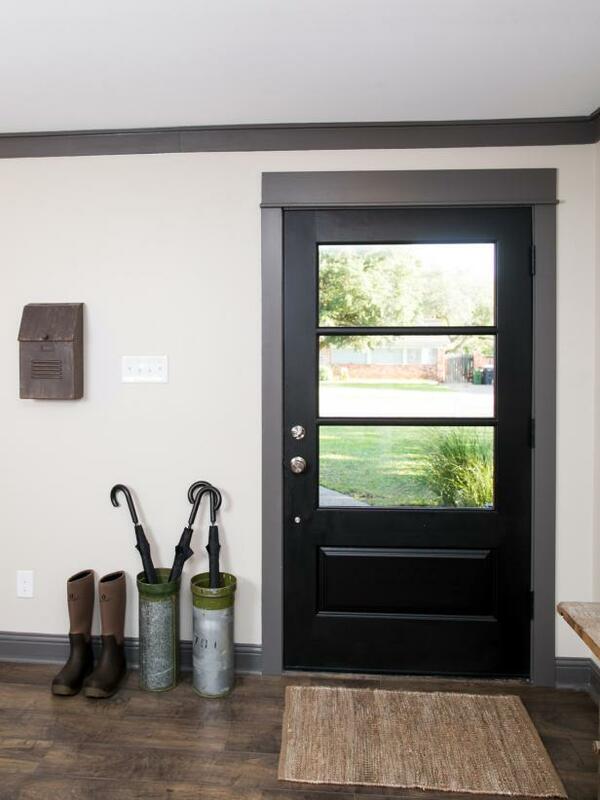 New windows and updated front door and twin sconces help draw attention to the new entrance as a visual focal point. 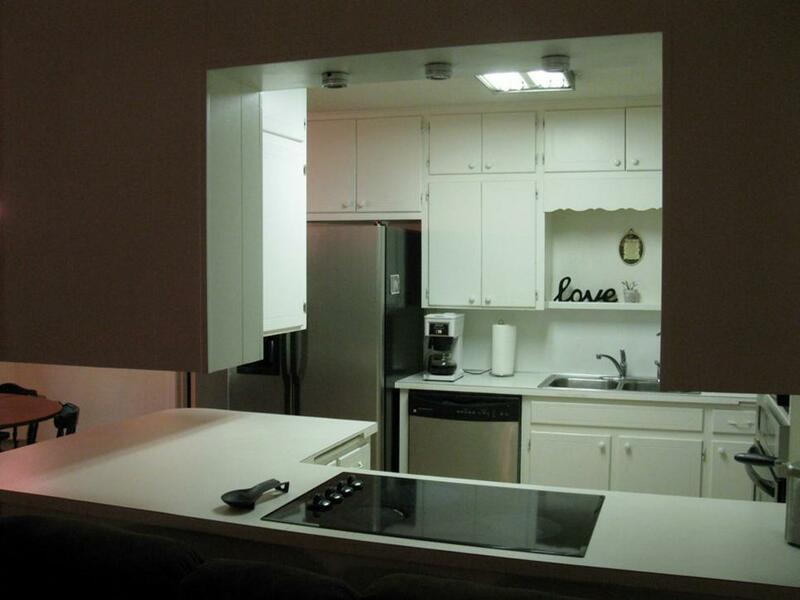 Prior to the renovation, the living spaces and kitchen were separated and not all floors were on the same level. 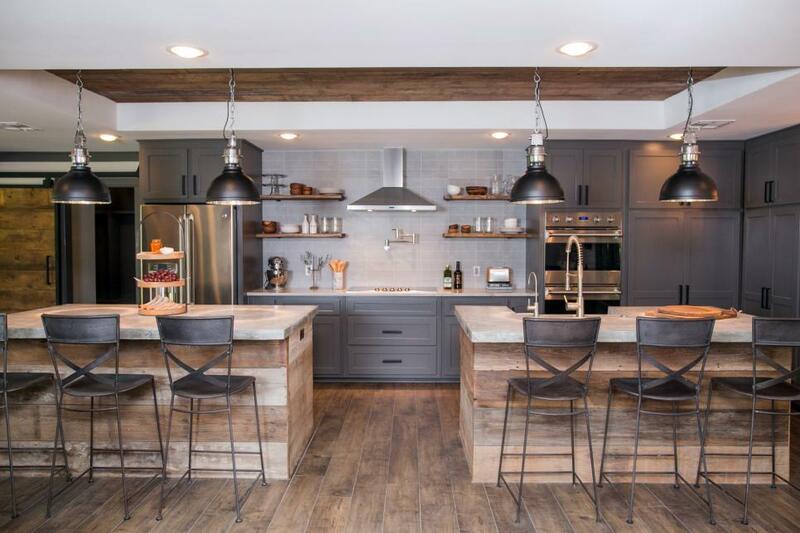 The new design brought all the floors to one level and merged rooms to create an open concept floor plan with sight lines between kitchen, dining and living spaces. 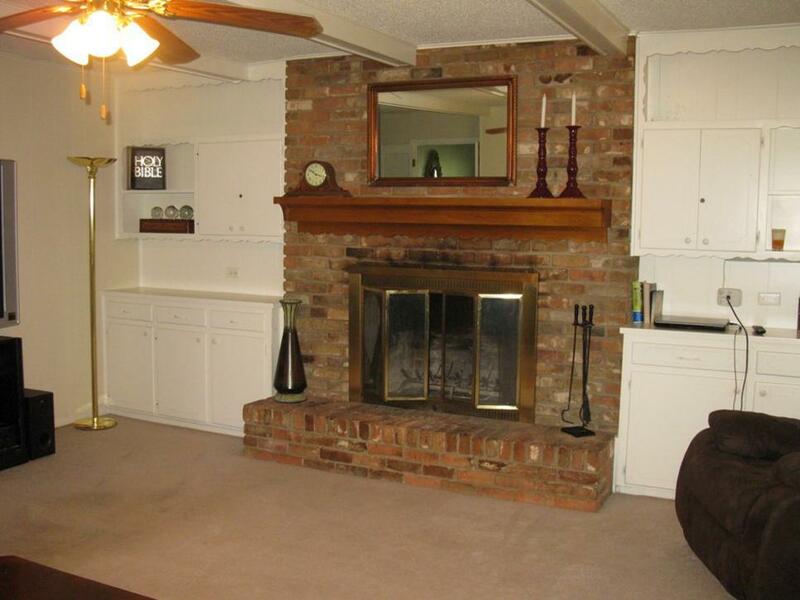 For this space, originally a separate den, Joanna recommended updating the fireplace, removing the built-in cabinets and replacing them with large windows to bring in natural light. 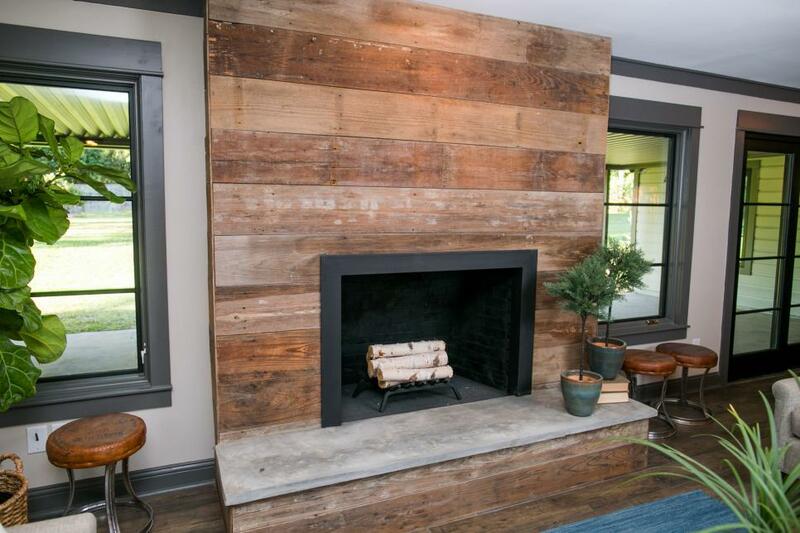 The space, now merged with the main living room, now has an updated fireplace with a surround clad in reclaimed wood and concrete hearth. 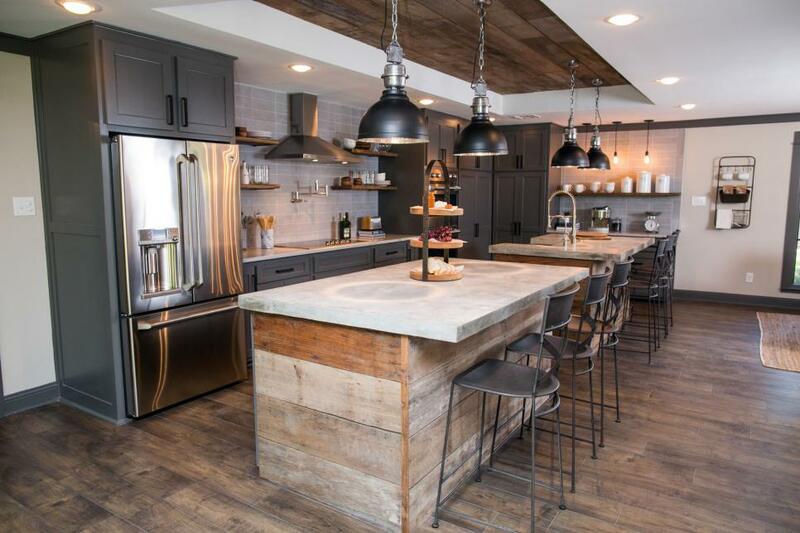 New concrete had to be poured in this space to bring all floors of the living space to a uniform level. 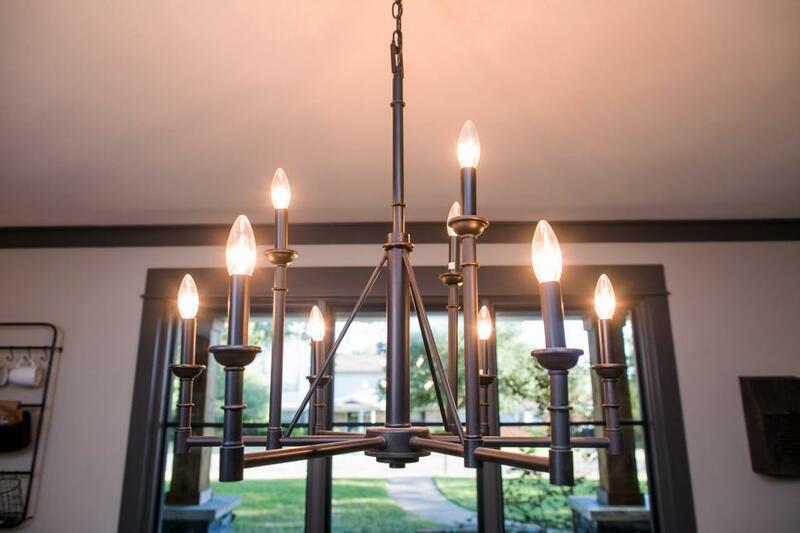 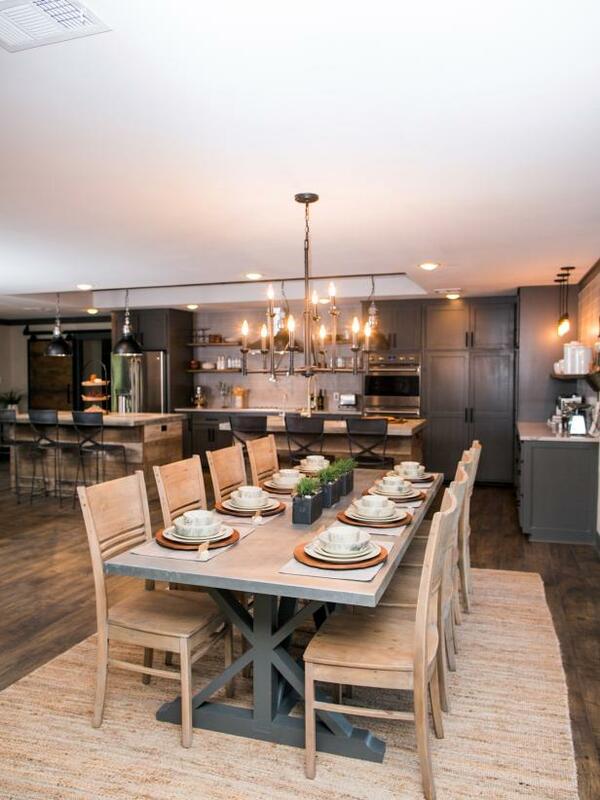 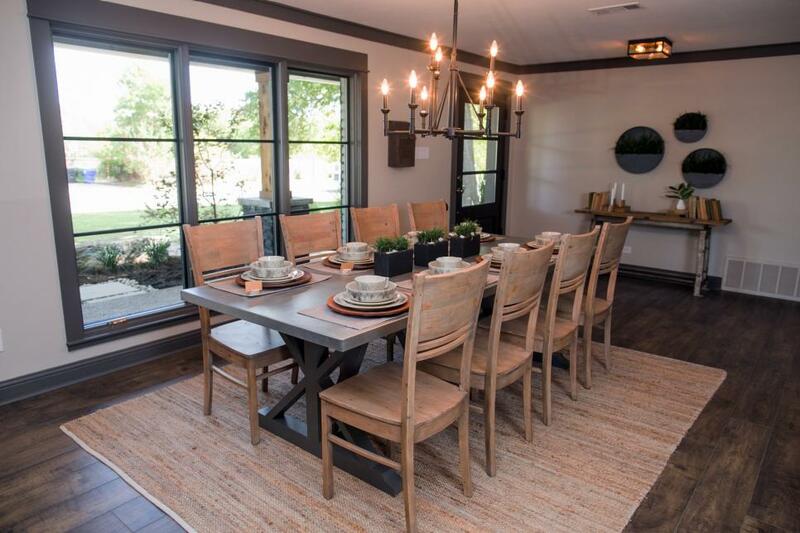 The newly configured dining space features a contemporary chandelier in brushed bronze finish and a dining table custom made by furniture artisan Clint Harp. 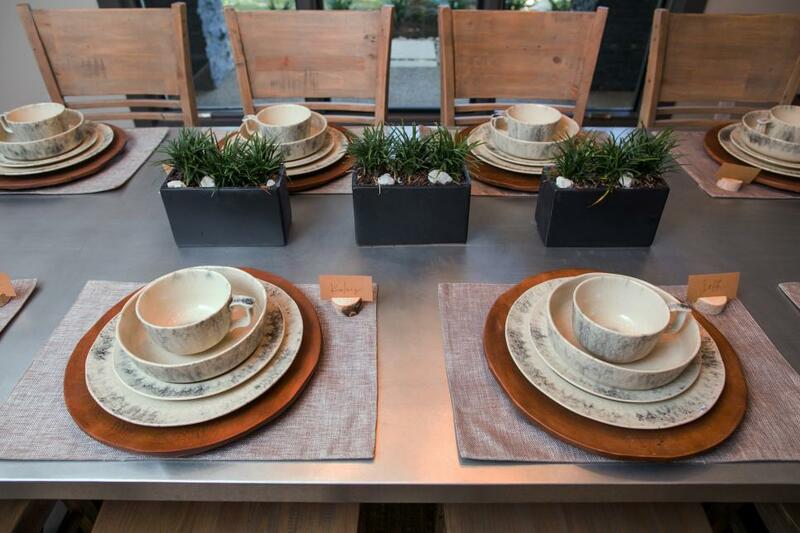 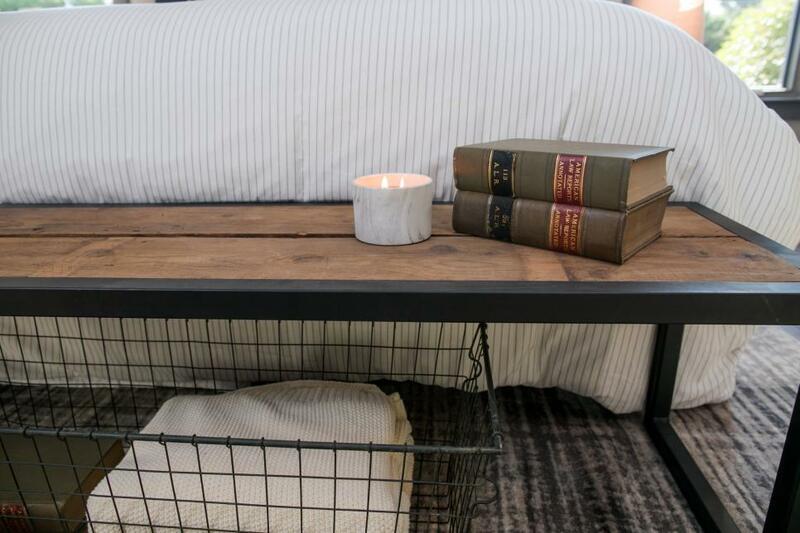 The table's surface is wrapped in galvanized steel, nicely offsetting the reclaimed wood surfaces and wood accents used throughout the space. 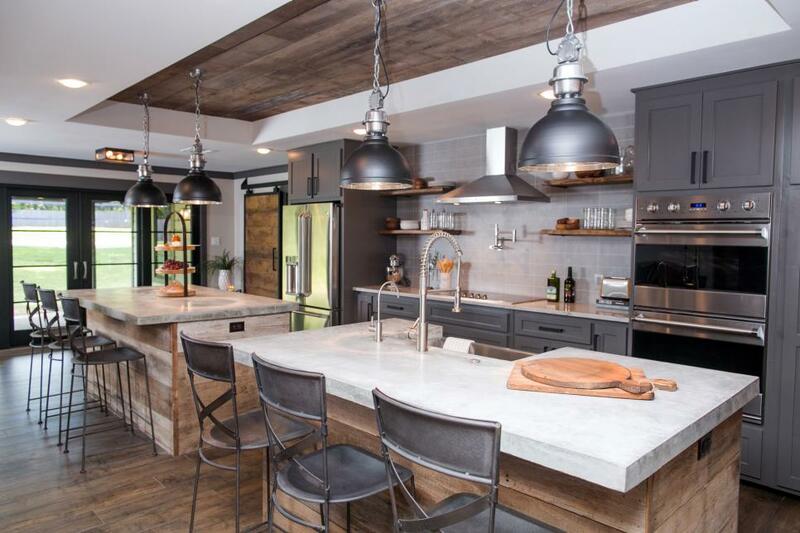 Prior to the renovation, the kitchen in this large home was surprisingly small, and the appliances and cabinetry were dated. 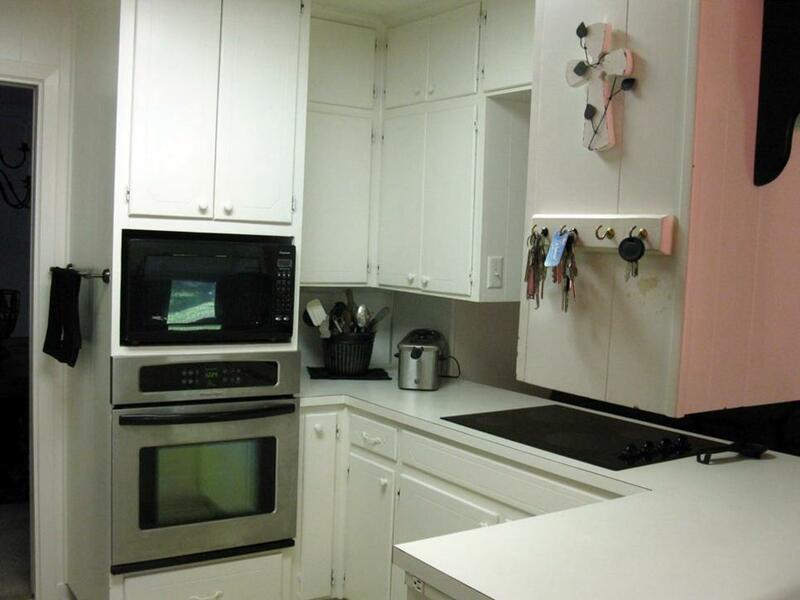 With walls removed and a top-to-bottom renovation, the new kitchen is barely recognizable as the same space. 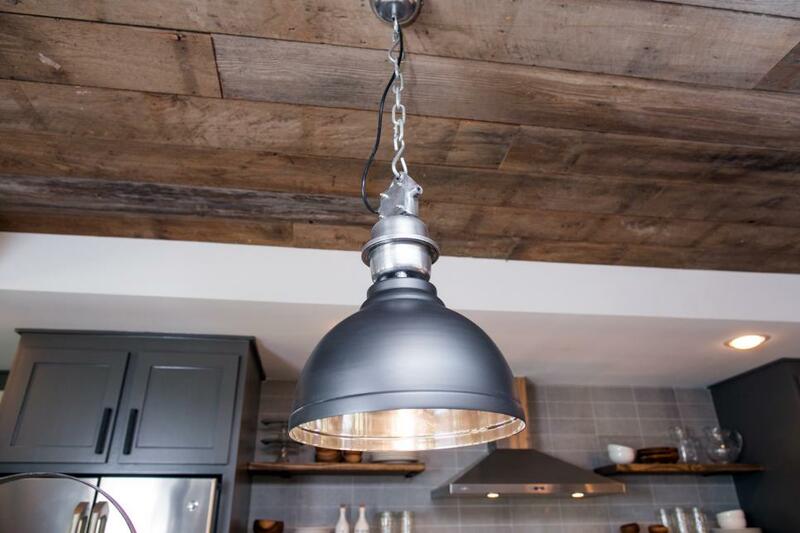 Standout features in the new kitchen include the large twin islands with concrete countertops, a custom box ceiling with reclaimed wood-panel inset and industrial styled pendants providing generous task lighting above the islands. 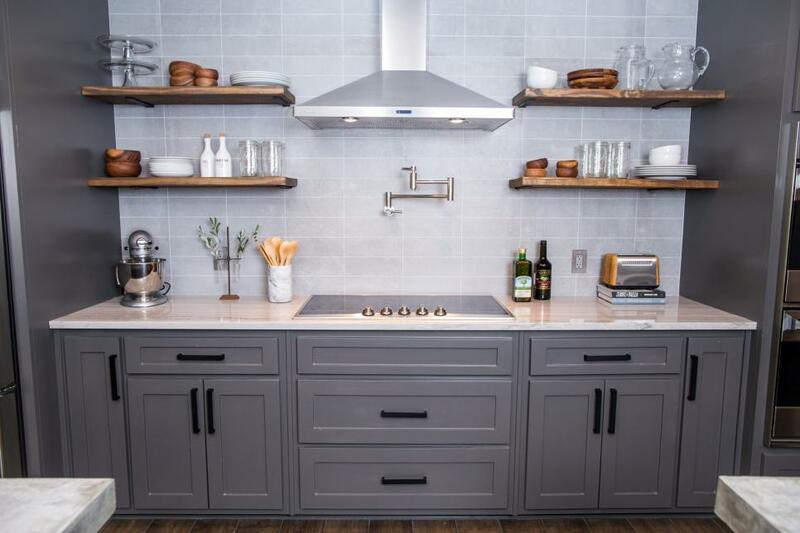 The newly expanded kitchen also comes with new stainless appliances and vent hood, recessed lighting, accent pendants, and plenty of storage and open shelving. 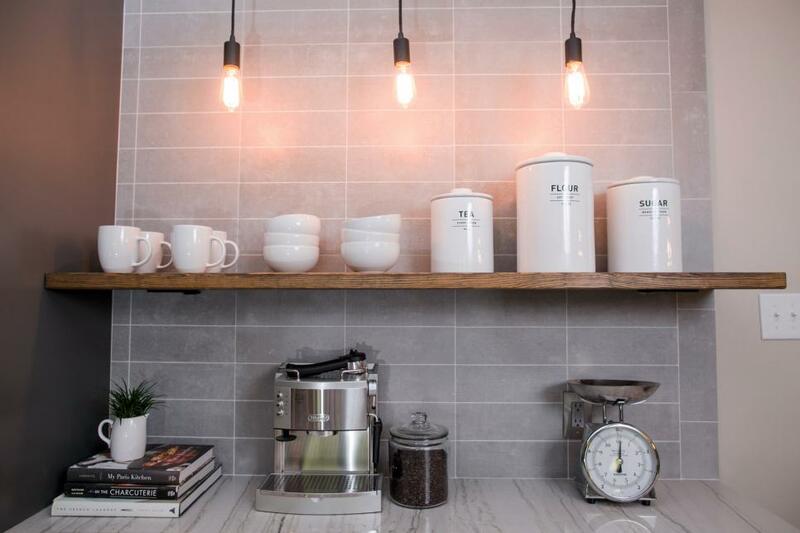 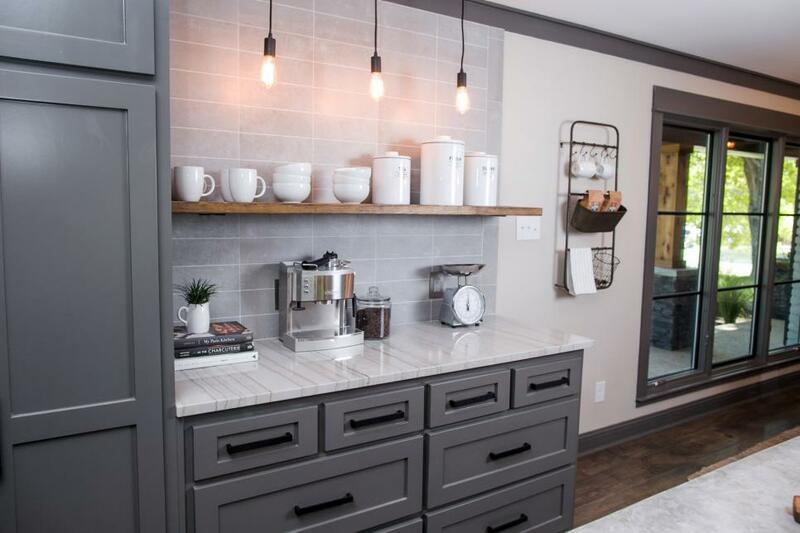 The kitchen also includes this coffee bar with gray tile backsplash, storage draweres, floating shelf and accent pendants with vintage style bulbs. 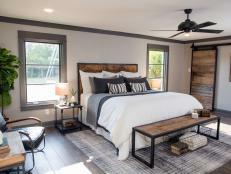 Prior to the renovation, the master bedroom had worn carpeting and an awkward layout with part of the bathroom impinging on the bedroom floorspace. 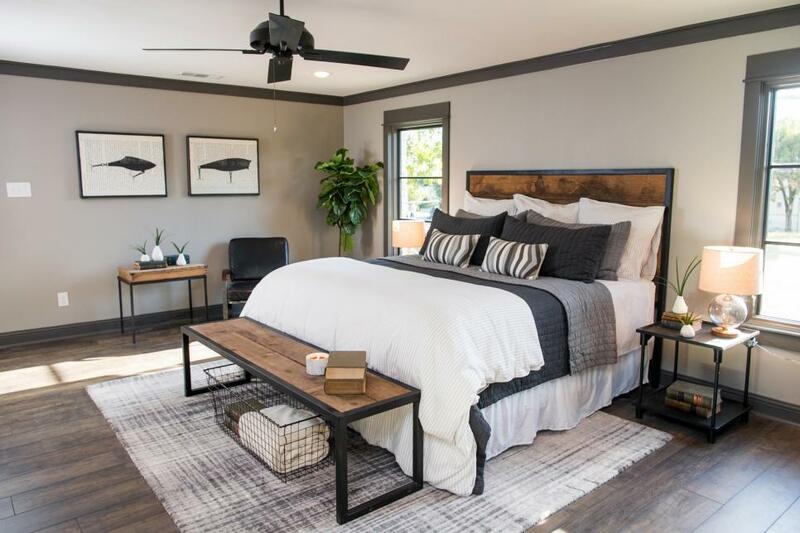 In the amended design plan, a small adjacent bedroom was sacrificed to create one large master suite with a much larger footprint. 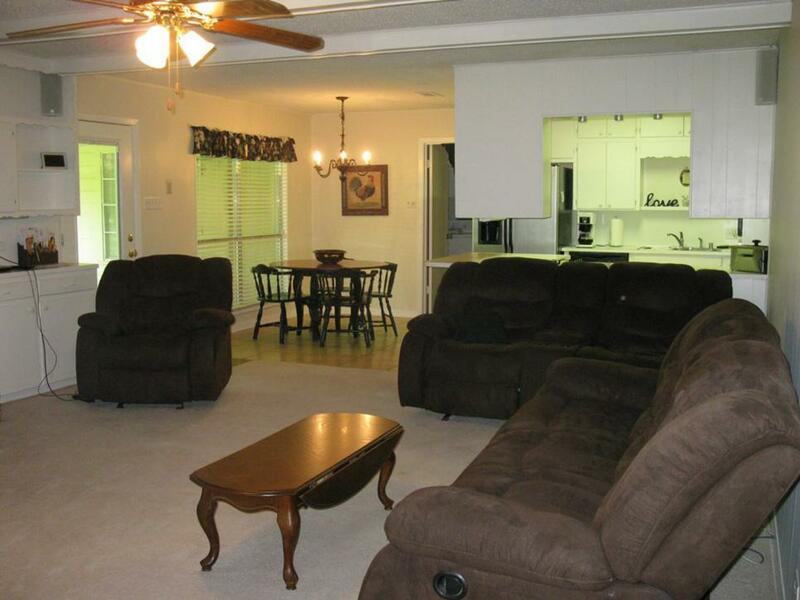 The old carpet and popcorn ceiling were removed, and new hardwood floors added as well as enlarged windows. 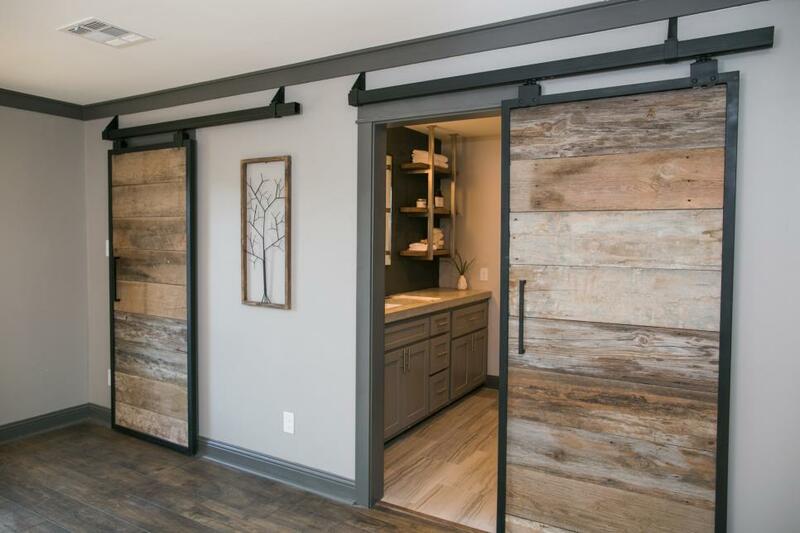 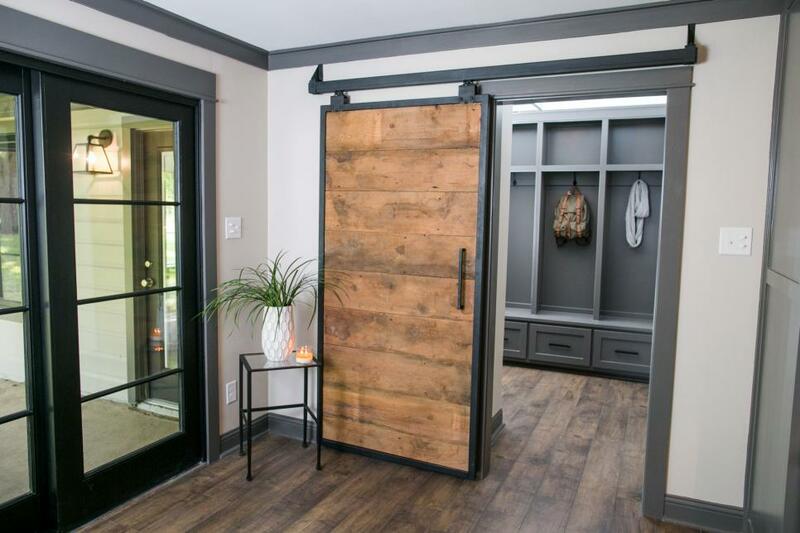 Twin sliding barn style doors were installed for the new walk-in closet and master bath. 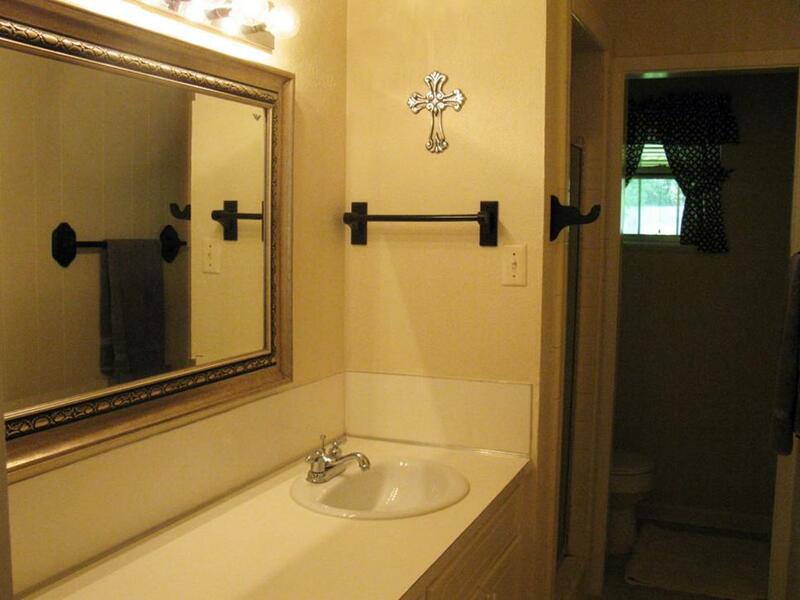 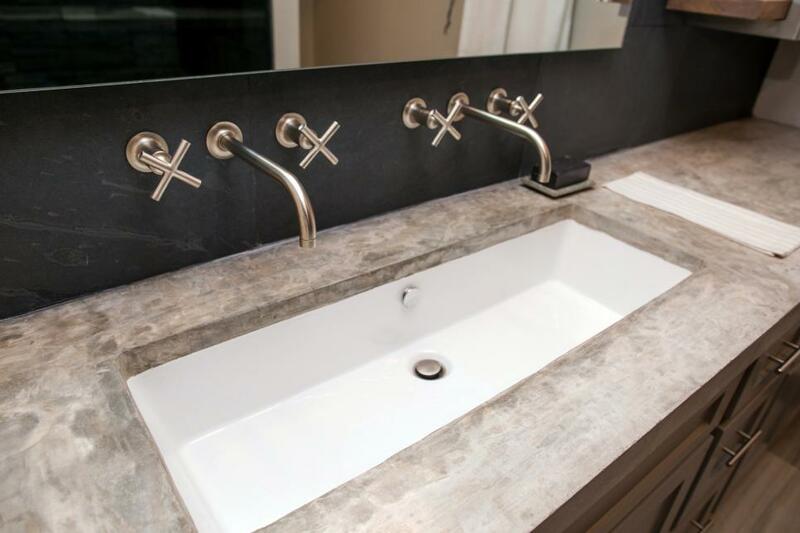 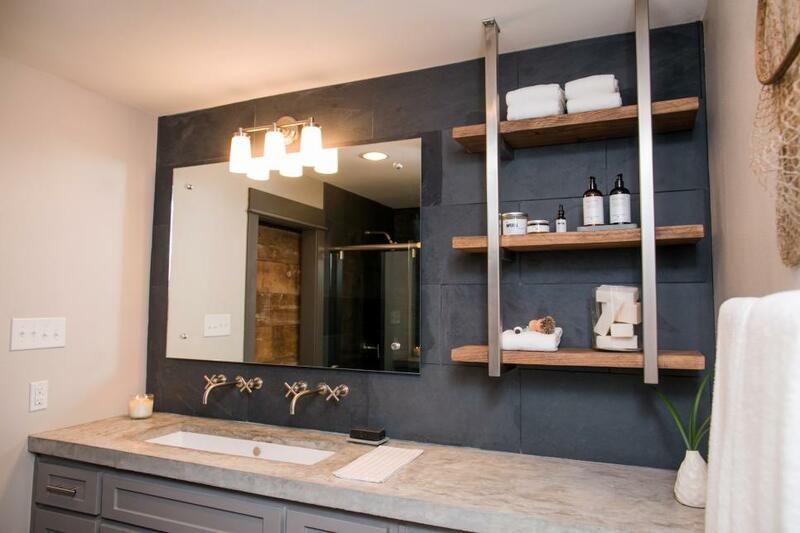 The master bath includes concrete countertops for the new vanity and s single large sink with dual faucets. 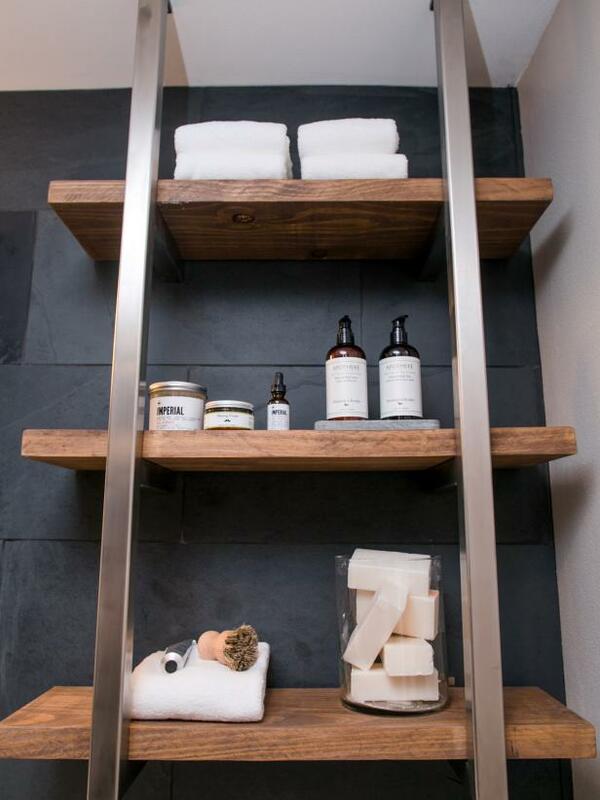 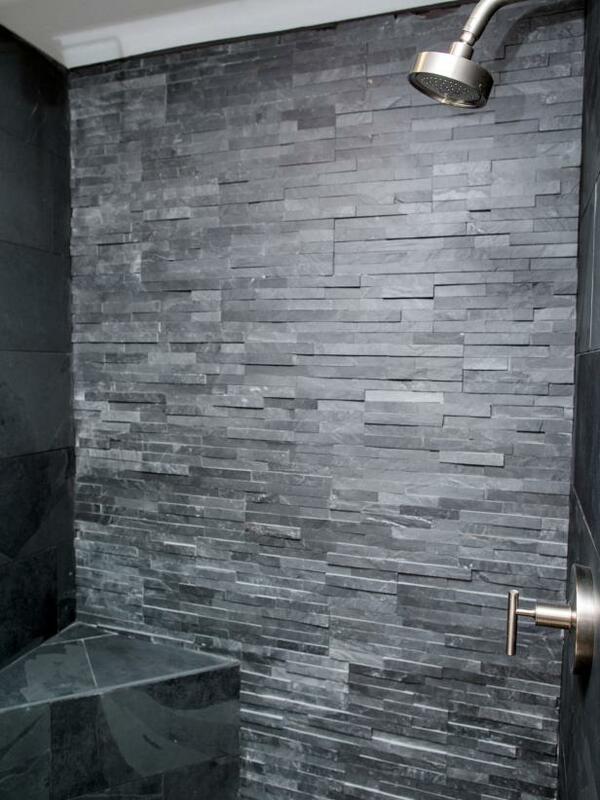 The new walk-in shower features seamless glass enclosure and dark gray stone tile similar to that used on the columns of the home's front exterior. 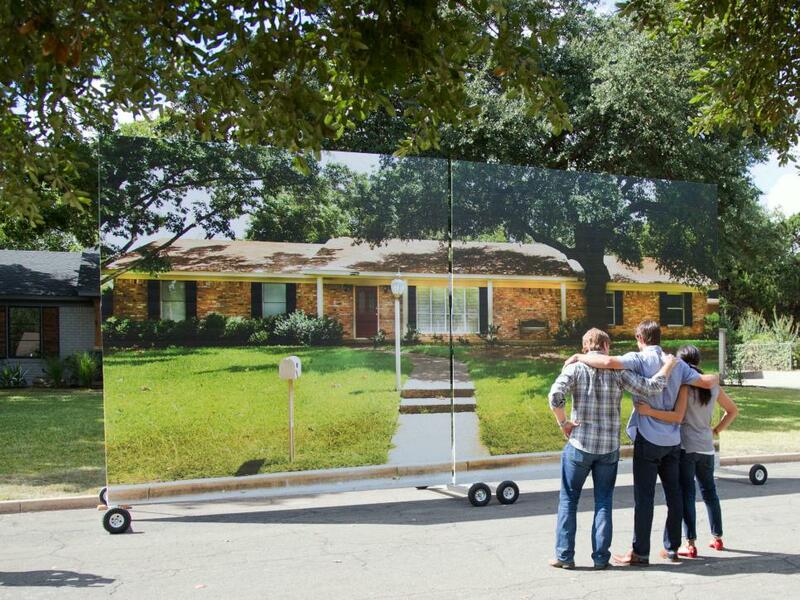 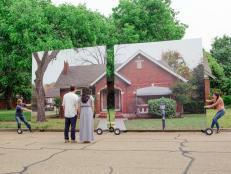 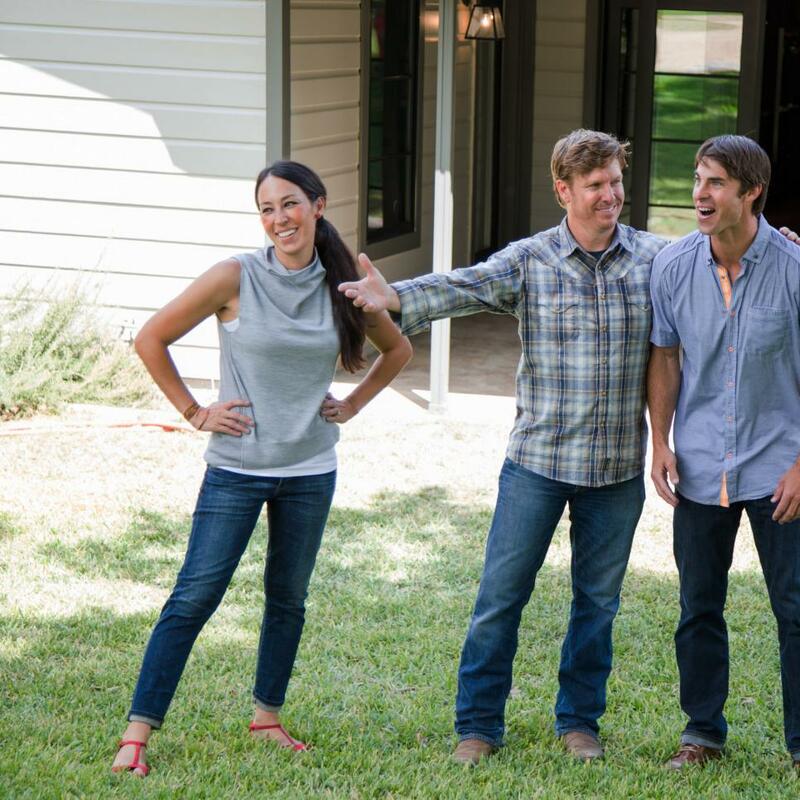 Chip and Joanna stand with homeowner David Ridley just before he sees his newly completed fixeru upper for the first time. 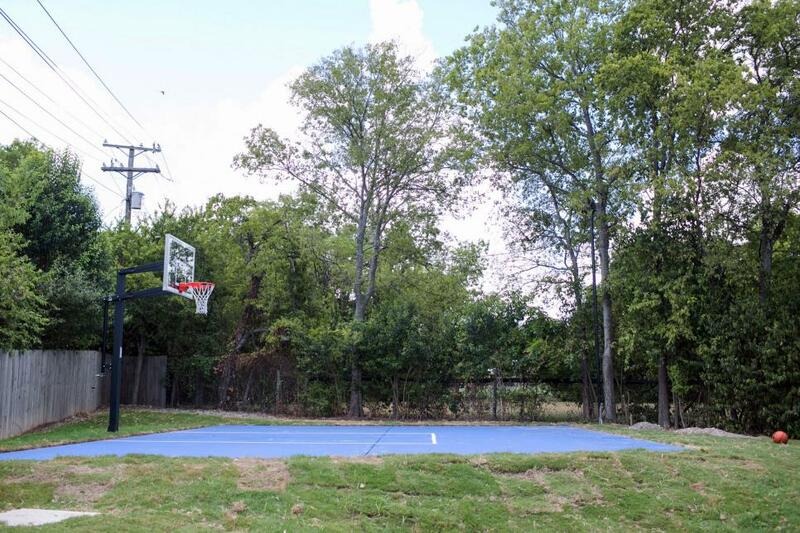 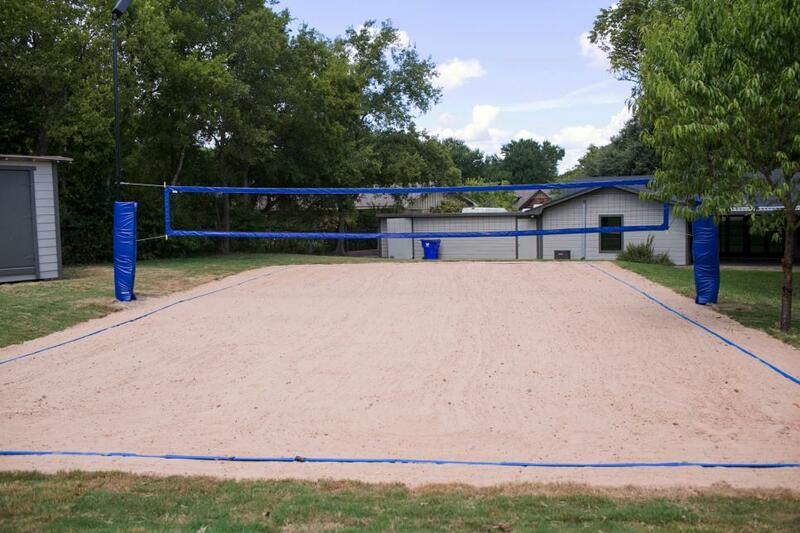 As a surprise housewarming gift, David's father comissioned Chip to build a volleyball court and a basketball court in the home's sizable backyard. 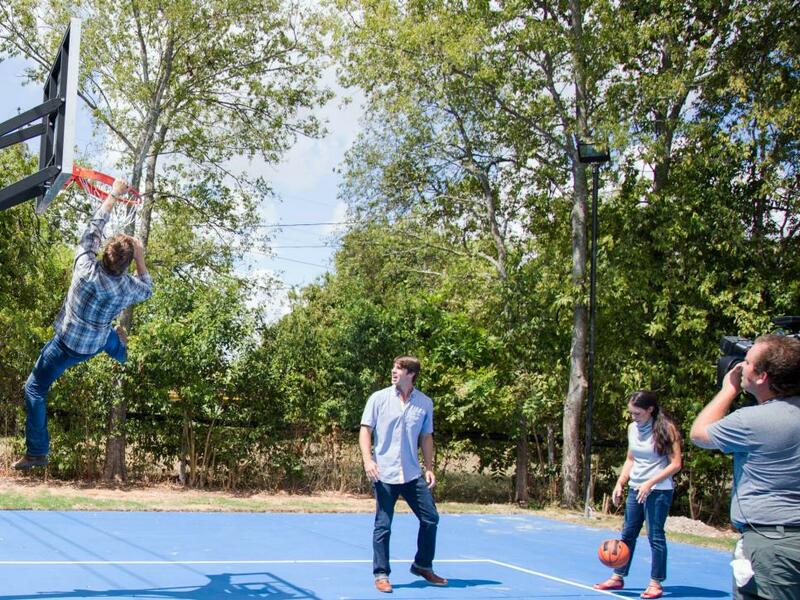 The crew films as Chip, David and Joanna try out the new basketball court. 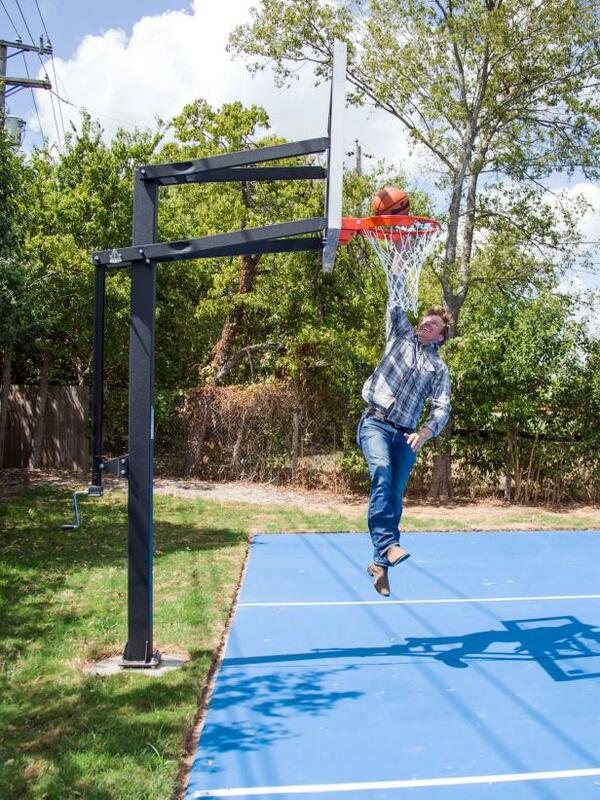 Chip displays his NBA style form and prowess in a flawless right hand lay-up.